Danish one-man studio AwesomeBlade Software has announced that its retro-themed platformer 8-Bit Boy is coming to the Wii U. Created by Rasmus Kønig Sørensen - a Danish ex-video game journalist with a bachelor degree in Construction Management - 8-Bit Boy is a love letter to the 2D platforming epics of old. Sørensen counts himself as a massive fan of the Master System, NES and Amiga 500, and it should come as no surprise to find that his creation shares a common bond with the likes of Mario, Sonic and Mega Man. The games storyline is somewhat based on my own story. Our hero is this depressed and unemployed 32-year old guy, who hasn’t been able to get a job after finishing his exams one year ago. Our hero gets sucked into this happy, vivid and colorful 8-bit world where he has to overcome many obstacles to help him out of the status quo of unemployment and help him support his family. So this is a personal story that deals with some adult issues like unemployment and feeling inadequate. Combine that with a vivid and colorful 8-bit world and you get something very different. This pretty much sums up my own story and I felt I had to do something about my own situation. To keep myself from going crazy from employment – I started programming 8-Bit Boy while looking for a job. So you might say that I also got sucked into this parallel 8-bit world of my own. I really hope you will enjoy 8-Bit Boy and relate to my story. 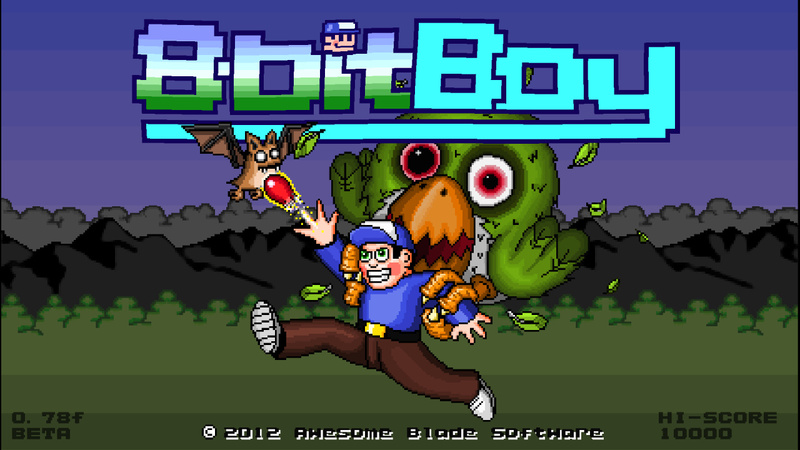 8-Bit Boy launches on Windows early next year, with versions planned for the Xbox 360, PS3 and Wii U. While there's no official confirmation, we're taking the wild guess that this is going to be a downloadable title rather than a retail release, so expect to see it on the Wii U eShop some time in 2013. Wow. Seems like a rather sad story. Here's hoping his game is pretty swell on Wii U! Looking good although it does look way to similar to Mario. A game made by a fan of Master System, NES and Amiga 500... SOLD! Funny. Most indie game developers are trying to jump on the "retro 8-bit/16-bit" bandwagon. You almost get the impression that these games are the easiest way to make some quick money. Wow that's the best reason to make a game I can think of. Bravo. I kinda know how he feels. I'm busy working on a game of my own in a similar way that I hope to release for Christmas. My game isn't for any Nintendo platforms at this time because it's a bit more difficult trying to get onto those platforms but hopefully that's something I can look into in the future. 8 bit boy only has 8 fingers! Coincidence or conspiracy? The story mad me cry. Good for him. It looks pleasant enough and sounds like a labor of love. Probably should replace the brick sprites with something that isn't a direct lift from Super Mario Bros. All Stars version. Not to mention the question block is sort of Mario thing. 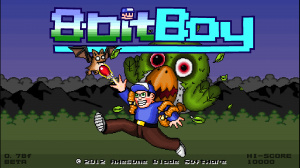 Looks good, I just hope people don't confuse it with Bit Boy!! Nice try @pixelman. You can give yourself every name and nationality you want, we all know you'll never finish it. what a surprise... an indie company going the way of 8 bit... i'm so frikin' tired of these "clever 8-bit platforming" games. I love that there is still a market for 8 and 16 bit games. I will absolutely be purchasing this upon release. What's the appeal of this game? I must have missed something. Looks nice! But I am not sure if this can be called a hommage (to Mario) or a rip-off! Well, Giana sisters on the DS was great fun! And 8-bit boy won't appear on mobile-phones, so big kudo's for that!! I'd give this game a shot. We all should before we shoot it down so quickly. That bird on the cover is absolutely terrifying. look it's captain N 15 years later!! !